Transfixed by my own feet, I have not been doing much quilting. Your kitty is so danged cute! I used to have a kitty that looked just like her. Love the book choices - too funny! Oh, I love those dollies!!!! They are precious--as is Rembrandt. Wow - what a tidy cupboard! (and such a cute cat). Yes, I laughed out loud at the book selection. 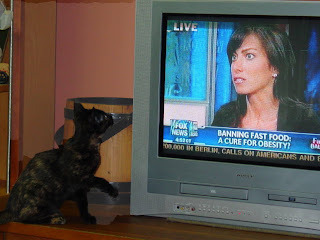 Kitty at the TV is so cute, as are those funny little dolls, which is what I think you are in those cute shoes. A dolly wannabe? (do you suppose they say that in Tibet)? Oh, I like your idea of a good book. Who is it by?